VioClean powerful truck mounted deep steam cleaning equipment, high pressured hot water, industrial natural solutions, and agitation bring maximum results! Our trained and professional technicians realize the importance of first impression and our number one concern is customer satisfaction! We use a high powered commercial turbine vacuum to remove dry, gritty soils. Pre Treatment with all natural cleaning agents to loosen sticky, stuck-in dirt and oily types of soils. Then we manually agitate with a carpet rake to lift and suspend soils for maximum removal. VioClean technicians recognize the importance of customer satisfaction. Our technicians make sure to take the time to treat stains with the appropriate solutions. We can treat all types of stains: adhesives, beverages, cosmetics, paints, dyes, foods, inks, rust, grease & oil. Your carpet is rinsed with 180 degree water from our truck mounted machine. This dirty water is extracted with a powerful vacuum into a holding tank in our van. Combination of heat, extraction, agitation & cleaning solutions brings maximum results! Are your high traffic areas worn & ugly? 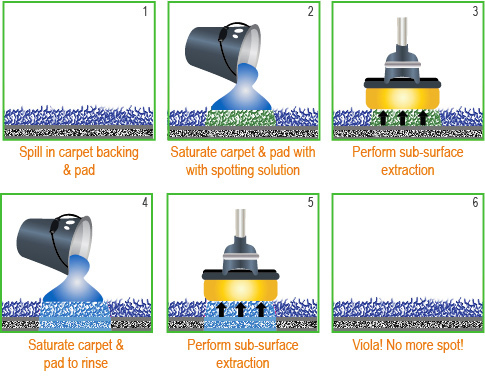 Carpet protection keeps liquid on the surface and prevents the spill from penetrating to the base of the fiber. PROLONG THE LIFE OF YOUR CARPET! ENHANCE YOUR STAIN RESISTANT WARRANTY! Is your pet making a mess of your carpet?. 1. Minor Odor Treatment – We use Bi-O-Kleen enzymes, which are formulated for chemically sensitive people and safe for your family. The enzyme is sprayed on each urine spot before cleaning to eat up the urine bacteria. This procedure will help reduce odor but is not intended on removing severe odor as this is merely treating the surface of the carpet. If you can smell the odor when you walk in the room, this is not minor odor. This will help reduce or control the problem, not eliminate it. Minor odor can only be smelled if you are on your hands and knees or on a humid day. The enzymes are applied for $10 per quart. The amount of enzymes needed depends on the severity of the problem. 2. Moderate Odor Treatment – Water claw sub surface extraction. With this process, we saturate the spot with a special oxidizing deodorizer so the cleaning agent reaches into the padding. We then use the “water claw” sub surface extractor to pull the urine out. This process will reduce the odor significantly, but may or may not completely cure severe problems. Moderate odor treatment is not guaranteed. CAUTION SHOULD BE USED IF THERE IS WOOD BENEATH THE CARPET. The “water claw” procedure is $25 for the first spot and $10 for each thereafter (each spot up to 1 square foot). 3. Major Odor Treatment – This is a full-blown odor treatment designed to completely eliminate the odor if the pet is no longer living in the home. The carpet is pulled up and padding discarded. The carpet is thoroughly cleaned on both sides with enzymes and oxidizing agents that neutralize the urine. The sub-floor, baseboards and backing of the carpet are treated with a special, clear, “odor barrier”. This procedure will undoubtedly correct any pet urine problem. The cost can range from $200 and up depending on the situation. Note: In most cases, we use the minor and moderate odor treatment procedures. We normally treat the more severe areas with the moderate treatment. Can you remove pet urine stains on carpet and upholstery? We have a success rate of about 80-90%. However, the success depends largely on how long the stain has been in the fiber. Pet urine can cause permanent damage to textiles as well as create an unhealthy indoor living environment if not removed promptly. When urine is first deposited onto a carpet or fabric, it is in a neutral state. This means it is easier to remove when it is fresh. Once the urine is allowed to dry it turns to alkaline (thus the ammonia odor) and becomes more difficult to remove. If left for months, depending on the fiber type, it could permanently change the dye structure of the fabric and cause the fiber to deteriorate. To prevent permanent staining, clean urine deposits immediately. What can be done about urine odor? We normally use enzymes or a professional grade deodorizer to treat urine. There is a small extra charge for each quart. First, we use a special urine detector to pinpoint exactly where the urine deposits are. Then we spray enzymes only on the affected areas. The enzymes actually eat up urine bacteria. These enzymes are also for sale for you to use between cleanings. Urine stains we cannot have any guarantees on. The stains could be permanent, although we usually have a very good chance of removal. What to do if you have a severe urine odor? If the odor is severe, the padding beneath the carpet may need to be replaced and the sub floor treated. We also treat the face fibers with enzymes, allow time to dwell, and then extract the enzymes. If the urine is covering over half of the carpet, it may be more cost effective to replace the room of carpeting. We normally only recommend this procedure if the pet is no longer in the home. Is vomit removable from carpeting? Yes, normally. However, the chances are reduced if an improper spot removal solution has been applied to the stain before our arrival. Also, some cat food has a red dye that permanently stains some nylon carpets. What can you do for recurring urine spots? First, we use our urine probe to determine exactly where the spot is. Next, we flood the area with one quart of Bi-o-kleen enzyme mixture and allow the mixture to dwell for at least 20 minutes. Last, we use our “water claw” spot lifter to pull the urine directly from the padding. This process eliminates 90% of all urine problems. If you have us do this process and the spot does return, we’ll come back at no charge to attempt removal again (we can only guarantee no spots returning on urine if the claw process is performed). Do you have a 100% Guarantee on Pet Odors? Unfortunately there is no way to completely guarantee odors of any type. The reason is that the odor may not only be in the carpet. It may be under the padding on the cement or wood beneath the carpet. It may also be on the baseboards, drapes, walls, etc. Furthermore, one cleaning may not be sufficient to take care of a severe urine odor. Sometimes return trips are necessary. How can I take care of pet problems myself? We have two excellent products available to help you do your own pet stain removal. We recommend the Spray and Wipe Cleaner or the Bi-O-Kleen Enzymes for more difficult pet problems. In conjunction with the Bi-O-Kleen products, we strongly recommend that you purchase a small wet vacuum or spot machine such as Bissel or Dirt Devil to extract the liquid out of the carpet. Paper towels never do as good of a job as a wet vacuum. We provide affordable carpet cleaning in cities across Massachusetts!